Farm equipment covers an extensive range of equipment engaged at several stages of agriculture such as land development, sowing, planting, cultivation, harvesting, and threshing. The range varies from simplest tools such as hand trowel to fertilizers, plow, harrow, fertilizer spreader, seeder and high-end engineered tractors. The World Bank has estimated that the demand for food will upsurge by 70% by 2050 and $80 billion annual investment will be required to meet the objectives. Such alarming ultimatum calls for efficient farming techniques and hence advanced farm equipment are the catch and have the potential to divert mandatory investments into its own pocket. As per the market outlook foreseen by a recent IndustryARC business intelligence report, the farm equipment market size ranges from $170 billion to $175 billion and is forecast to grow at a global CAGR of around 6% going through 2025. Farm equipment are a global phenomenon but APAC is the fastest growing regional market with a global CAGR of 40% - 45% which is mainly attributed to the impeccable agricultural lands and market of India and China. FICCI (Federation of Indian Chambers of Commerce & Industry) stated that Indian agriculture sector contributes approximately 14% to India’s GDP. And Organisation for Economic Co-operation and Development revealed that China has 21% of global population in its territory along with 9% of universal arable land. Farm equipment market in this report has been segmented into different phases accumulating the over-all agricultural production from land development to harvesting and threshing. The agricultural equipment involved at different stages are tractors, fertilizing, plant protection equipment, harvesting equipment, irrigation equipment, hay and forage equipment, crop processing equipment, seeding equipment, grain handling equipment, cutters, shredders and sprayers. 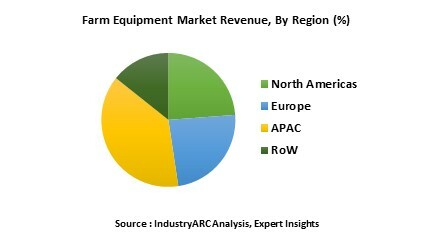 As of 2018, irrigation machinery leads the application segment covering nearly 10% of the entire global farm equipment marketplace owing to harsh topography and weather conditions prevailing in majority of developing countries constituting a major chunk of global population dependent on agriculture. Efficient irrigation facilities empower the agro-economy by contravention of constraints such as deficient water supply. Drip irrigation systems save water and nutrients by enabling water to drip slowly to the roots of the plants and minimize evaporation. A classic example can be derived from a World Bank data which states that the Peru Sierra Irrigation Subsector Project made a substantial impact in increasing agricultural production and productivity ranging between 118 percent and 170 percent in targeted areas of the Peruvian Sierra. Farm Equipment market is not solely dependent on the agricultural industry. Some of the other factors indirectly but positively influencing the market are financing equipment such as agriculture finance and agriculture insurance initiated by governmental and non-governmental organizations. The World Bank Group is a leading global financier of agriculture, with $6.8 billion in new IBRD/IDA commitments in 2018. In the recent years, the world has witnessed unprecedented demand from the robustly growing F&B sector owing to rapidly increasing world population. Traditional farming techniques are time consuming and less economical in terms of labor costs, and global reduction in farming lands further adds to the dilemma. To combat and deliver under such crucial circumstances, employment of farm equipment by agricultural sector is inevitable. For example- The World Bank preceding statistics reveals that an outstanding 25,054,140 tractors were already globally employed as of January 2019 and with the advent of machineries practices in agro sector along with improved financial aids, the deployment is going to be at a more dynamic scale affecting the global farm equipment market. Two of the major challenges surfacing this flourishing and imperative domain are financial aspects such as capital and rate of interest and unskilled agronomic man force. But it is also to be noted that the financial aspects are being slowly countered by various organizations and bodies providing low-interest loans, zero to low-interest credits, and grants to developing countries for agricultural operations. To skill the agronomic man force for utility of farm equipment which will automatically consequence in efficient production, various countries has come up with machineries institutes and e-farming portals. A sheer example from the often recalled as land of agriculture, India, is the Central Farm Machinery Training & Testing Institute, Budni (M.P.). Some of the key players mentioned in the report are AGCO, John Deere, CLAAS, Massey Ferguson, Argo Group, Mahindra and Mahindra, Hunter Industries, Toro Corp., Jain Irrigation, Bucher Industries, CNH Industrial, Kvernerland Group, SDF Group, Kubota, Lindsay Corp.
John Deere, an American giant commemorated the production of its 5,000th Forestry Swing Machine, a 2656G Log Loader in January 2019. The company was among the first to introduce electric drive technology in off-highway equipment and their 644K and 944K Hybrid Wheel Loaders have collectively logged more than 1 million operating hours in the field. The Irish Farm Tractor & Machinery Trade Association hosted the biggest ever ‘The FTMTA Farm Machinery Show,’ on February 7th, 8th and 9th 2019. 160 national and international machineries manufacturers and distributors were stationed to meet their potential customers and take the farm equipment market ahead of the curve. AGCO, which comprises Massey Ferguson, Fendt, Valtra and other farm machinery brand-names, accounted for revenues approaching $10 billion in 2018. AGCO merging with Fendt, has embarked upon several milestones. A recent example is towed plant protection sprayer, Fendt Rogator 300, and the self-driving Fendt Rogator 600 marking their sale of 100 units. AGCO Corporation received seven AE50 Awards from the American Society of Agricultural and Biological Engineers (ASABE) in 2019 and AGCO/Fendt wins the AE50 Award in US for best new Fendt IDEAL large combine. The base year of the study is 2018, with forecast done up to 2025. The study presents a thorough analysis of the competitive landscape, taking into account the market shares of the leading companies. It also provides information on unit shipments. These provide the key market participants with the necessary business intelligence and help them understand the future of the farm equipment market. The assessment includes the forecast, an overview of the competitive structure, the market shares of the competitors, as well as the market trends, market demands, market drivers, market challenges, and product analysis. The market drivers and restraints have been assessed to fathom their impact over the forecast period. This report further identifies the key opportunities for growth while also detailing the key challenges and possible threats. The key areas of focus include the types of equipment in the farm equipment market, and their specific applications in different phases of agricultural production. By Application- Agri Equipment, Construction Equipment, Chemical Applications, Financing Equipment, Material Handling Equipment, Snow Removal Equipment, Property Maintenance Equipment. By Agricultural Phase- Land Development, Sowing, Planting, Cultivation, Harvesting, and Threshing. 15.9. Daedong Industrial Company Ltd.